Made with Turkey, Ocean Fish, Potatoes and Carrots. Perfect to feed alone or mix with dry food to improve palatability. 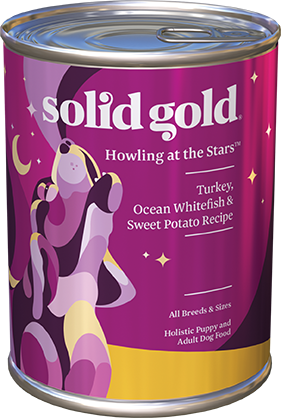 Canned food is great for senior dogs with dental problems or for young puppies. Turkey, Chicken Broth, Turkey Liver, Ocean Whitefish, Ground Brown Rice, Carrots, Barley, Sweet Potato, Tricalcium Phosphate, Guar Gum, Cottage Cheese (Milk, Whey, Inulin, Salt, Citric Acid, Guar Gum, Mono and Diglycerides, Corn Starch, Xanthan Gum, Locust Bean Gum, Carrageenan, Added Color, Bacterial Culture, Microbial Enzyme, Carbon Dioxide, Vitamin A Palmitate, Vitamin D3), Oatmeal, Alfalfa Meal, Flaxseed Meal, Olive Oil (Preserved with Mixed Tocopherols), Carrageenan, Cassia Gum, Potassium Chloride, Salt, Choline Chloride, Zinc Proteinate, Iron Proteinate, Thiamine Mononitrate, Vitamin E Supplement, Copper Proteinate, Manganese Proteinate, Sodium Selenite, Cobalt Proteinate, Niacin Supplement, d-Calcium Pantothenate, Vitamin A Supplement, Riboflavin Supplement, Biotin, Vitamin B12 Supplement, Potassium Iodide, Pyridoxine Hydrochloride, Vitamin D3 Supplement, Folic Acid.